Saw us coming and never moved. To all pedestrians in and around the city (a.k.a. peddies), why walk in the bike lane when you have the sidewalk, and sometimes, additional walking areas? You don’t walk in the street where the cars are, so … We ring our bells, we blow our whistles to little or no avail. I am a virgin city cyclist. I’ve relied on my two feet far longer than my new two wheels, so I, too, am a peddie at heart. But as a peddie I am mindful of the bike lane. To those who are not, please pay attention. Please be considerate. Please be safe. Bikes are a growing part of city life here and increasingly being embraced by neighborhoods. In fact, according to a recent poll by The New York Times, sixty-six percent of New Yorkers said they thought bicycle lanes were a good idea, with support highest in Manhattan. These ladies did step aside at the sound of our bells and whistles. What’s your take? 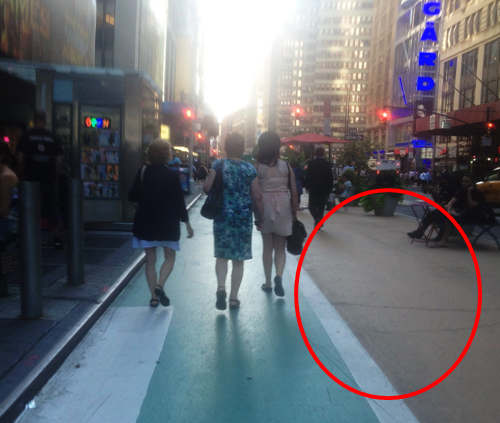 When walking, do you use the bike lane as your own private Idaho or is it more an accidental wander? 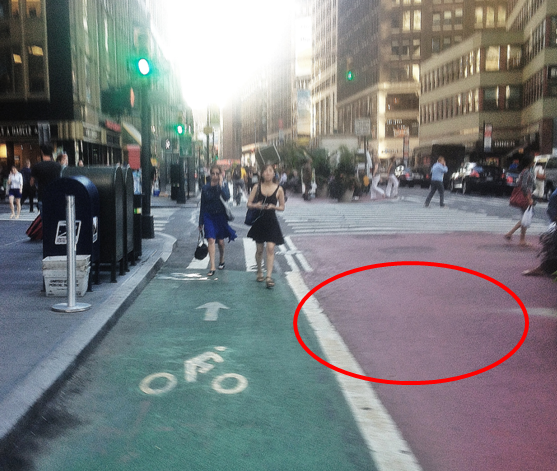 When riding in the bike lane, how do you navigate peddies in your path? What’s the fix? Is the bike lane simply something new we all have to get used to? Chime in and please specify in your comment whether you are peddies or wheels. Nice and loud, now, this lane is for my wheels and meeeeeeee. Transportation Alternatives offers a plethora of resources for all kinds of commuters, including various discounts when you become a member! I completely agree, although it has been many decades since I biked in NY; not sure if bike lanes existed then. You’re right, Karla. These bike lanes are relatively new in and around the city. As of February 2009, there are about 170 miles of painted lanes throughout greater NYC-area streets, with Brooklyn having the greatest success in terms of residents respecting the lane. Thanks for chiming in! Hey johngee! Your comment rings true for many wheels, me included. Hopefully this is a matter of awareness and something that will steadily improve. Thanks for your feedback!